The New Jersey Devils have announced that forward Jesper Bratt has been placed on injured reserve and will be out of the team’s lineup indefinitely with a fractured jaw. Bratt reportedly suffered the injury in practice. The NJDevils have placed F Jesper Bratt (fractures jaw) on injured reserve. The 20 year old Bratt came out of nowhere in his rookie season with the Devils, putting up 13 goals and 35 points in 74 games, playing mostly alongside Hart Trophy winner Taylor Hall. The 6th round selection (162nd overall) of the 2016 NHL Entry Draft was a surprise to make the team out of training camp last season and did not look back once he made the team. He became a fixture on a line with Hall and, as a result, he put together the best statistical season of his young career. In Bratt’s 2016-17 season he scored just six goals and 22 points in Sweden’s second tier league. In the NHL he more than doubled his goal total… go figure. The 5 foot, 10 inch, 175 pound speedster from Stockholm, Sweden is part of a young, emerging core of players on the Devils these days that includes Hall, 2017 NHL Entry Draft first overall selection Nico Hischier and 2017 Hobey Baker Award winner Will Butcher. With these young, talented and dynamic players forming the nucleus of a young Devils squad, the team is set up for success in the coming years. Unfortunately for Bratt, this injury couldn’t come at a worse time. The kid is just gearing up to take things to the next level and looked poised to blow last season’s statistics out of the water. 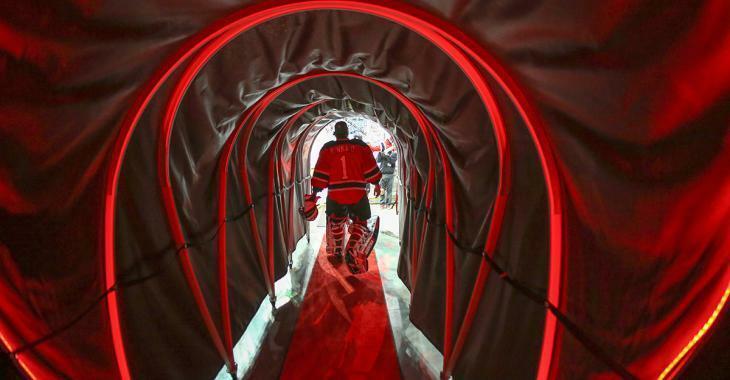 Here’s hoping he makes a full recovery in short order and gets back into the Devils’ lineup.